A resident pins the Jamaican national flag at a makeshift community memorial for Saheed Vassell on Thursday. 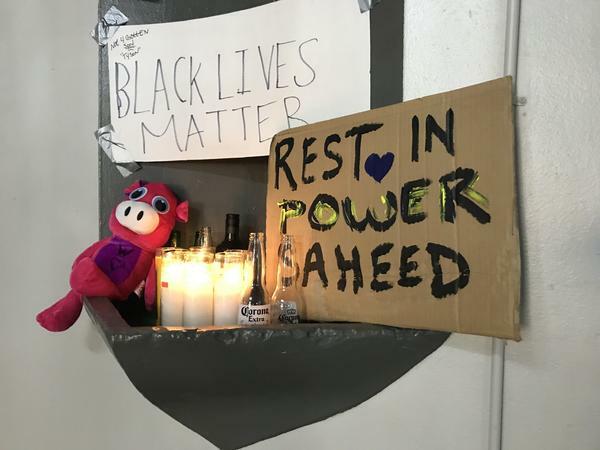 A makeshift memorial for Saheed Vassell, 34, stands Thursday in the lobby of the apartment building that neighbors identified as his father's residence. 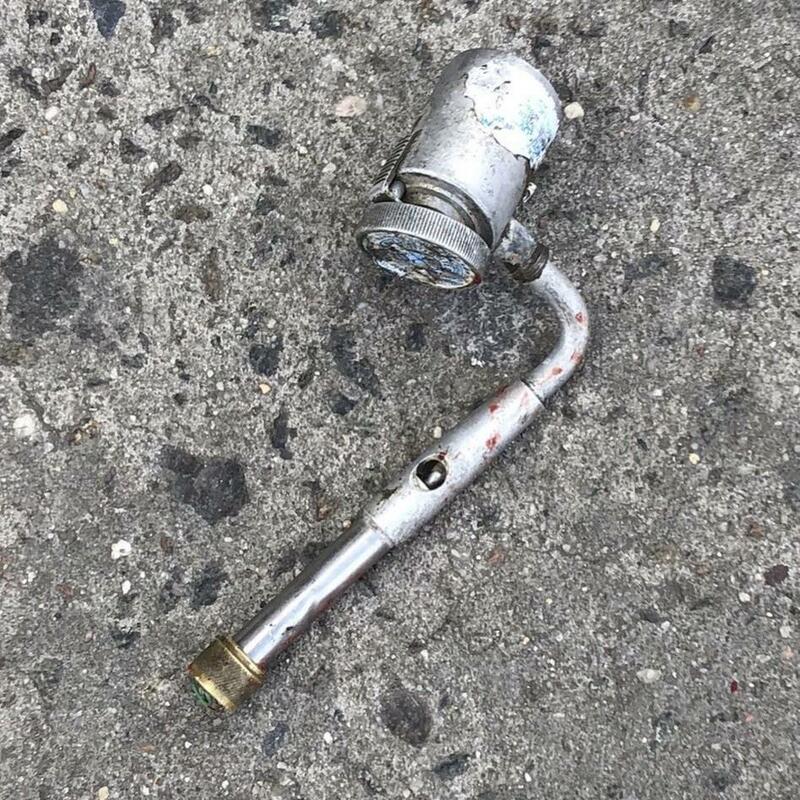 An image of the pipe found at the scene of the police shooting, provided by the New York Police Department. Roughly one day after New York City police officers shot and killed a mentally ill black man the department has released video clips and transcripts of the 911 calls received in the moments leading up to the confrontation. The four officers had opened fire Wednesday afternoon on Saheed Vassell, 34, after mistaking a metal pipe in his hand for a firearm. In the video, pulled from security camera footage in Brooklyn's Crown Heights neighborhood, Vassell appears to pull the pipe on several passersby, pointing it at them in gestures reminiscent of aiming a handgun. The transcripts displayed show several callers referring to a possible gun in his hand. "There's a guy walking around the street," reads one transcript, "he looks like he's crazy but he's pointing something at people that looks like a gun and he's popping it as if like if he's pulling the trigger." Five officers responded to the calls around 4:40 p.m., NYPD Chief of Department Terence Monahan told reporters. Monahan said four of the officers opened fire after Vassell took a "two-handed shooting stance and pointed an object at the approaching officers." Monahan said they fired 10 times, while Vassell was struck a total of nine times, according to New York City's chief medical examiner Thursday. It was only after Vassell hit the ground that police say they discovered he had been holding a metal pipe with a showerhead, not a weapon. 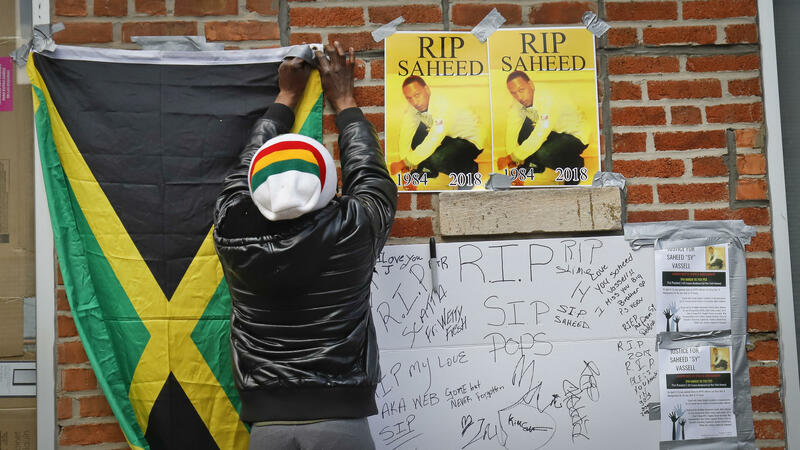 In the hours after the shooting, anger and sadness swept through Crown Heights, the neighborhood where he spent most of his life and where residents say he was a well-known — and well-liked — figure. "Man, that's our boy," David Bailey told NPR's Joel Rose. "We know this man for like, ever since. He comes to hang out in the barbershop, you know what I mean?" Bailey and others said Vassell's struggles with mental illness were also well-known, even among local police: "It's visible. You could see it," Bailey added. "Listen, Ray Charles could see that man was crazy." Vassell's father, Eric, told The New York Times that his son had been hospitalized multiple times in recent years with bipolar disorder. In comments to the New York Daily News, he said his son had refused treatment and had not taken medication for the condition in years. "We were always worried for him," he told the Daily News. "We would say, 'Should anything happen to him, we just have to do what we can do.' "
Monahan, however, disputed the notion that officers could have known about Vassell's mental illness. "This was not an emotionally disturbed call," he told reporters. "That was a call of a man pointing what 911 callers and people felt was a gun at people on the street. When we encounter him, he turns with what appears to be a gun at the officers." But some of Vassell's neighbors questioned why police fired so quickly — and so many bullets. Witnesses told the Times that the officers "appeared to fire almost immediately" after they got to the scene, and that "they did not hear the officers say anything to the man before firing, while another witness said she heard the officers and the man exchange some words." As many as 200 onlookers gathered at the scene immediately after the shooting, resident Shaya Tenenbaum told The Associated Press, and several of them shouted at police. Protesters carrying Black Lives Matter signs arrived later in the evening, the Times reports. Members of the crowd "wept" at how the shooting fell on the 50th anniversary of the Rev. Martin Luther King Jr.'s assassination. Vassell's death comes as the police shooting of Stephon Clark, an unarmed black man, has ignited protests in Sacramento, Calif., that have lasted weeks. "They need to get it together," a longtime neighbor of Vassell's, named Angie Lewis, told Joel. "Stop acting, responding before you find out more. I could see you shot him in his hand, his foot. Ten bullets — for what?" Residents told news outlets that the younger Vassell was well-known in the neighborhood as "mentally ill but generally harmless." "All he did was just walk around the neighborhood," 38-year-old Andre Wilson, who said he knew Vassell for 20 years, told the Daily News. "He speaks to himself, usually he has an orange Bible or a rosary in his hand. He never had a problem with anyone." Scores of people gathered for a vigil and protest Thursday in Crown Heights, where local media report the rally rippled with chants of "no justice, no peace." New York Attorney General Eric Schneiderman has announced his office is opening an investigation into the incident, noting that "we're committed to conducting an independent, comprehensive, and fair investigation." Mayor Bill de Blasio called the shooting a tragedy in comments to the media. "This is someone who had a profound mental health problem — was not on medication, hadn't been on medication," de Blasio said. "A man like this, if he had gotten the help we needed, hopefully would never have been in a situation where such a horrible painful, tragedy would have occurred." One big reason Alton Sterling's death became national news was a cell phone video and a warning that even the audio is a bit disturbing. It captured police officers struggling with, then shooting Sterling.